If your poaching water’s too hot, the meat overcooks; if you leave the meat in the water too long, it overcooks; if you use too little water, the meat_you guessed it_undercooks. There are a lot of variables when poaching chicken. Thankfully, cooking sous vide eliminates most of them. 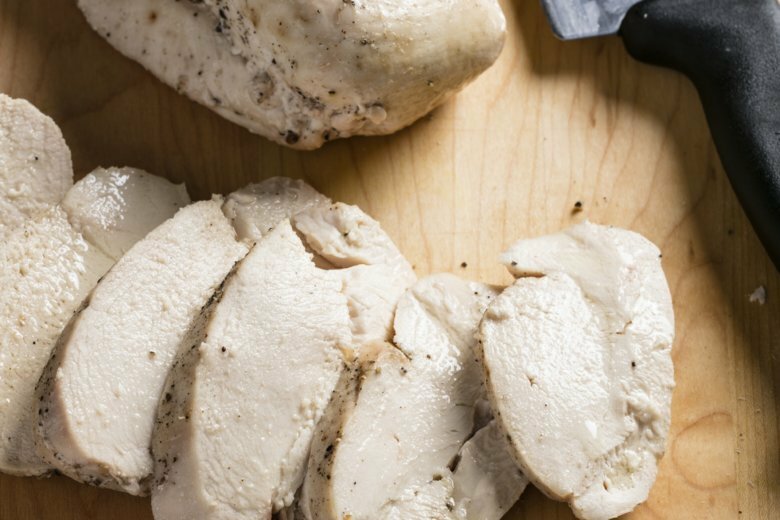 For foolproof poached chicken, we cook chicken breasts at a moderate temperature for about an hour, which results in a juicy, tender texture that’s just firm enough that it doesn’t fall apart. While this recipe is finished in an hour, you can hold the chicken in the bath for up to 3 hours before the texture starts to change_giving you some flexibility. This perfectly poached chicken is great on its own or sliced over salad. In addition, this method is a great starting point for experimentation and variation, so feel free to add spices, herbs, or boldly flavored marinades to the bag (just don’t add fresh garlic; it is particularly susceptible to botulism). Using sous vide circulator, bring water to 150 F in 7 quart container. Season chicken with salt and pepper. Place chicken and oil in 1 gallon zipper-lock freezer bag and toss to coat. Seal bag, pressing out as much air as possible. Gently lower bag into prepared water bath until chicken is fully submerged, and then clip top corner of bag to side of water bath container, allowing remaining air bubbles to rise to top of bag. Reopen 1 corner of zipper, release remaining air bubbles, and reseal bag. Cover and cook for at least 1 hour or up to 3 hours. Transfer chicken to paper towel-lined plate and let rest for 5 to 10 minutes. Serve. — Combine 1 teaspoon salt, 1/2 teaspoon pepper, 1/2 teaspoon garlic powder, 1/2 teaspoon minced fresh thyme, and 1 teaspoon grated lemon zest in bowl. Sprinkle chicken with salt mixture. — Omit salt and pepper. Whisk 1/4 cup soy sauce, 1/4 cup sugar, 1 teaspoon grated fresh ginger, 1 teaspoon toasted sesame oil, and 1/2 teaspoon white pepper together in bowl. Substitute soy sauce mixture for oil. Nutrition information per lemon-thyme variation serving: 395 calories; 174 calories from fat; 20 g fat (2 g saturated; 0 g trans fats); 166 mg cholesterol; 684 mg sodium; 1 g carbohydrate; 0 g fiber; 0 g sugar; 51 g protein. Nutrition information per soy-ginger variation serving: 325 calories; 64 calories from fat; 7 g fat (1 g saturated; 0 g trans fats); 166 mg cholesterol; 1262 mg sodium; 11 g carbohydrate; 0 g fiber; 10 g sugar; 52 g protein.